A young teenage boy floats helplessly in a tank of amniotic fluid. To the outside world he appears brain dead though kept alive because he is the only successful sample of Superman's DNA merged with an anonymous human donor. What they are unaware of is that 'Superboy' is very much aware of his surroundings and is full of questions. Three months down the line however the bosses of the N.O.W.H.E.R.E science facility are not interested in keeping a vegetable alive and have ordered his termination. A doctor that the clone seems to have bonded with urges him to fight against his fate and Superboy soon realizes he is about to die. Thankfully due to 'Red's' whispered warning his telekinetic attack instinctively kicks in and everyone save for Red combusts from the inside out. Sadly 'Red's' superior wasn't able to reveal the identity of 'Superboy's' other parent before he died and as the termination protocols failed 'Red' was put in charge of the project. The subject however was suffering bewilderment. The influx of sensory overload coupled with freedom from the tube is almost too much for him to take in. When he notices the destruction he caused and 'Red' running towards him, his meta-human abilities switch off. Without the power of flight he hurtles to the ground but the girl he trusts saves him. He is finally free. One month later Superboy is now in a Kansas High School. The super-intelligent, yet socially inept, head of the class. Somehow the clone is able to tap into incredible amounts of information he has never, ever, learnt. His awkwardness in class makes him an outcast but a silver haired classmate, Rose Wilson befriends him and goads him into walking her home. She asks prompting questions about right and wrong, good and evil, empathy and ambivalence. Though the trusting clone suspects nothing as he heads home to his foster parents and his home on a farm. Here the clone feels a strange inner inbuilt sense of boredom and a sense he should be moving onto something bigger. His freedom, an illusion. 'Red' watches the clone toss and turn in bed and deactivates the VR simulation. She isn't happy. Why was the clone dreaming of Kansas? Why was he going over and over the same feelings? Most importantly why if he is part Superman did he completely ignore a woman in a burning building in favor of furthering his own selfish whims with Rose? Was Superboy's other donor a pathological, megalomaniacal, narcissist? What is the mystery and why can't they solve it? Rose appears fresh from the VR simulation. She is the only real factor besides the clone in the program. 'Red' and Rose don't get on and in fact Rose reveals the bosses upstairs have charged her with terminating 'Superboy' AND 'Red' should he ever lose control again. Doctor Umber, one of the staffers on 'Red's' team, sneaks into a restricted area and logs into a secure webcam connection to speak to a reporter. As the connection establishes, a woman named Lois Lane appears. Umber has been feeding her information on N.O.W.H.E.R.E but not of Superboy's existence. Should he reveal the answers Lois is really after he would surely be killed. The next day the clone is fitted into a containment suit to focus and test his telekinetic potential. He admits that he can't help but think about 'Red' his 'friend' and 'jailer' and on the other side of the plexiglass she feels the bond too but her thoughts are interrupted when her new boss arrives, Zaniel Templar, the mouthpiece of the powers that be. The clone is so super sensitive he can feel the arrival of Zaniel's helicopter on N.O.W.H.E.R.E's rooftop and is uneasy to feel Zaniel's inhuman nature. Despite 'Red's' plea to keep Superboy in a controlled environment Zaniel overrules it. He has a problem that he intends to use Superboy to solve. Despite his feelings the clone readies for the mission, a small price to pay for his freedom. The mission? The death of the Teen Titans. Story - 5: I won't delve into the past, I rode that train already. It was a good journey but if that's what you're after you'll have to check out the back issues, trade paperbacks and digital releases - this is a new character and a new journey. As first issues go it delivers a lot more than the previous 'Super-centric' books. Both Justice League and Action Comics didn't really push the envelope exploring the character but here in Superboy, characterization is all you get. In actual fact the mysteries 'Red' is trying to fathom shed a great deal of light on the new Clark Kent and Superman dynamic. It's very well written and the inner monologues of the clone really push his confusions with the memories and intelligence that aren't his. Almost like Superman and the mystery donor's inherent memories are all he has and he is just a shell for them despite having a personality all his own. The scenes where he is initially released and feels air, experiences sensations and realizes his abilities, are a touch of brilliance. It should be noted that he is the second clone (according to the artwork). Rose inadvertently takes on the Lana Lang role and at first we're thrust into a pseudo Smallville. At first the 'one month later' scene really threw me, I thought at first it was terrible, I'll be honest, it sucked. However just like the confusion 'Red' feels I was taken aback by the woman in the burning building too. I fell for the sucker punch and it was a brilliant twist because it makes you as the reader reevaluate the entire plot. I really enjoyed the fact it refused to be formulaic with the story. The cameo from Lois with Doctor Umber didn't feel forced at all and felt like a great twist to link this book to the current Superman series to come. There is just enough of the original series 'feel' to be familiar with but so much more to enjoy with a new sleek update. This Superboy seems to be far more powerful than even he realizes and with an intellect to rival a Brainiac, despite the fact he doesn't know why he does or how to use it, drawing on scenes from both the Smallville series and Supergirl movie. I hope you'll stick with me on this new journey to see where this new Superboy goes because if all the issues are as strong as this we're in for a superb ride. Art - 5: You may not have seen the Jimmy Olsen Special earlier this year (the introduction of Chloe Sullivan) but R. B. Silva was charged with the art duties there and he again delivers his unique style to Superboy's adventures. The art is less cartoon-like now but retains that unique feel. There are some truly spectacular sequences that I honestly can't see anyone but Silva delivering it in as fantastic a fashion. Cover Art - 2: I see what Canete and Major are trying to convey with the cover but it's truly misleading. 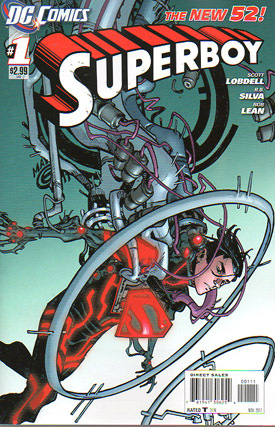 In fact when it was first leaked there was a confusion as to whether Superboy in the Teent Titans and this cyborg were two different characters and as it turns out, this rendition is neither. As a piece of art it oozes cool, but in relation to the character and book, it just doesn't fit, and that is a pity as I think Superboy #1 deserved a full 5/5 rating overall.